If you bring your damaged Corvette to any run of the mill auto body shop, the dollar signs will ring in their eyes, since they know they can get you to pay a handsome price to fix your Corvette. When you are looking for a Corvette repair shop, you need someone who isn’t going to overcharge you for sub-par work; you need someone who cares as much about your Corvette as you do. Express Collision Center is the Corvette repair shop you have been looking for. We have been restoring and repairing Corvettes for over 70 years. In addition to being fully certified by General Motors for repairing the Chevy Corvette, we ourselves are enthusiasts of the iconic Corvette, and serving as a Corvette repair shop is not just a business, it is a real pleasure to help out any Corvette, or any other vehicle, owner getting their automobiles fixed up and back on the road. When it comes to being a Corvette repair shop, Express Collision Center has the certification, training, expertise, and most importantly the passion for repairing Corvettes from all generations. 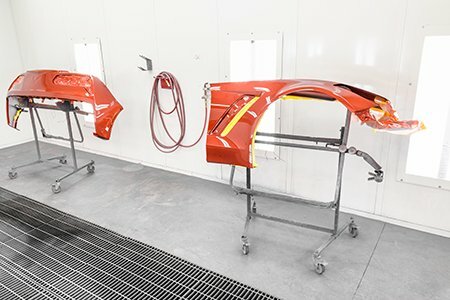 We can restore, fix up, and repair anything you throw at us; even if your Corvette has a custom paint job, we can match the paint and clean it up for you to make it seamless. When it comes to repairing your late model Corvette, certification is very important. Express Collision Center is certified by General Motors and is the recommended Corvette collision repair shop for Ed Bozarth Chevrolet. No matter where or when your purchased your beloved Corvette, we are the experts. If you are looking for the ideal people to repair your Corvette, Express Collision Center is the place to go. With our experience, passion, and fair pricing you will not be able to find a better place to leave your treasured Corvette to get the work done on it you need. Don’t just trust your Corvette to anyone in town; choose the Corvette repair shop with the stamp of approval not just from General Motors, but the Las Vegas Corvette enthusiast community at large! Call us today at (702)676-2010 for more information, or stop by our Corvette repair shop today right on the corner of Flamingo and Decatur!